Wooden three-story ryokan and other buildings stand with swaying willow trees along the Ootani River. This is where I was born and raised, and now I run my own ryokan. 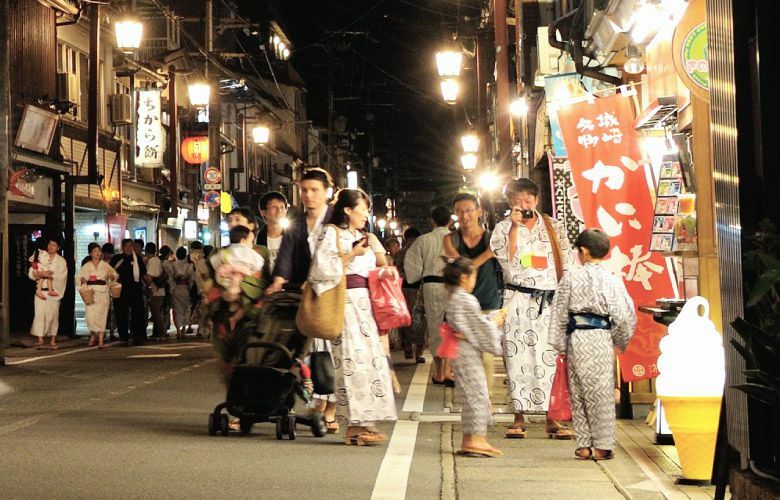 In town tourists dressed in yukata wander up and down the streets visiting the seven bath houses located throughout the town creating a scene of “JAPAN” that you might have imagined and expected before coming to Japan. 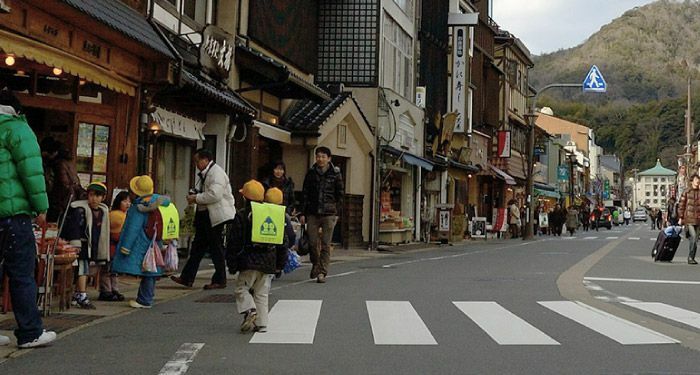 You can walk the town of Kinosaki Onsen from end to end in about 30 minutes. It’s not a very big city, but has a population of about 3,500. 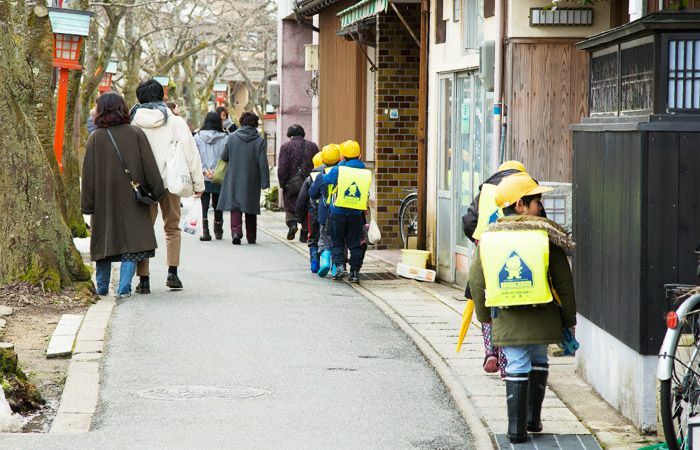 There are nursery schools, kindergartens, an elementary school and junior high in town and so often you’ll see children with their school bags passing by with the tourists. You’ll see other forms of rural community and life if you walk down one of the narrow side streets that branch off from the main street, here you’ll see laundry out to hang and neighborhood aunties chatting about the world and life. At the local fishmonger you can spot tourists purchasing fresh seafood next to one of our neighbors who is buying items for dinner tonight. As a hot spring resort that welcomes about 700,000 visitors a year, there are many moments and places where you can see and feel the “life of the locals” in this onsen town where preservation of life and traditional landscape is carried out. 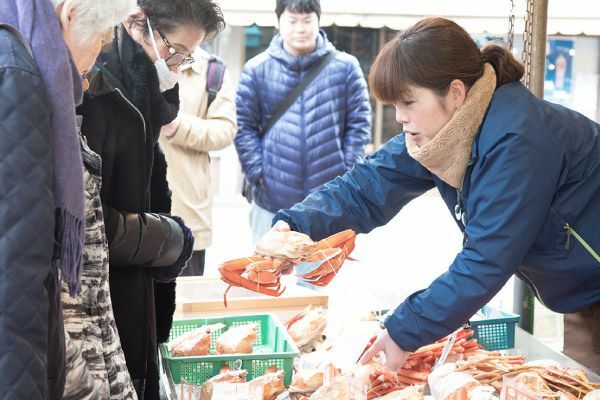 The local people’s “way of life” coexists with “tourism”, perhaps such a tourist area is hard to find in many parts of Japan. Now, to talk a little about Kinosaki Onsen, there are seven hot spring bathhouses. They are used by tourists and locals. In the past there were many families who did not have their own household baths, because of this “bathing in outside baths (baths not in the house)” was pretty standard in Kinosaki. I myself can not go as often because of my work schedule, but when I was a child taking a bath meant going to one of the bathhouses. After dinner we would meet with friends and head out to one of the bathhouses, and often be scolded by a neighborhood grandpa for goofing around in the bath who would then try to teach us the proper way to enter the baths and behave in the public spaces. You can usually spot who the locals are because they are usually the ones who duck through the curtains with a washbowl that has shampoo and soap in it. Especially “Jizo Yu”, it has a higher ratio of locals there. In Kinosaki Onsen, it’s said that news is exchanged at the bathhouses and coffee shops, like “So and so has died”, “so and so is sick”, or “so and so can do such and such”. Here is where town topics or gossip just flies around. From what I have heard there is a neighborhood grandma who helps the ladies fix their yukata or shows them how to properly take a bath in the women’s bath. Yeah, you can say that the people of Kinosaki are typically very helpful and caring. It may be because we have had a long history of hosting many tourists. The life style rhythm for the families that run businesses in Kinosaki is unique. Shops that line Yunosato Street end their afternoon hours around 6 PM and close up shop once so they can have dinner and take a bath (usually at one of the bathhouses) before opening shop again and usually staying open till 11pm. This is in accordance with when the bathhouses usually close. Ryokan dinners are usually served between 6 PM and 8 PM. Shops reopen around the time tourists finish their dinner and then head out to do some shopping or play at the arcades on their way to the bathhouses. 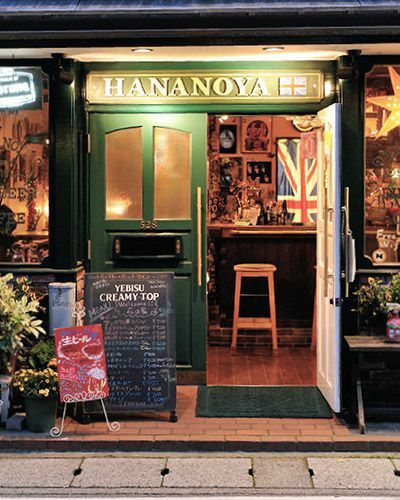 There are also some shops that open for tourists to enjoy a drink or snack. This type of business is “the norm” and “natural” for Kinosaki Onsen. By all means please share a chat with the locals over a drink, they can teach you about Kinosaki’s hidden spots. By the way, you can find a lot of locals in the pubs and snack bars. Ha, or rather the majority of them are locals. Both tourists and locals drink shoulder to shoulder at the counter. Sometimes I catch them sharing a drink…actually that is something I often see. Because they are locals who live here they have a lot of information they can share with you about hidden sightseeing spots and what not, so by all means please share a chat with them. A proud town that knows how to do hospitality. I would say that the specialty of Kinosaki Onsen is that “the people of this town do hospitality”. The people who were born here, those who have loved the town and have come to live here, and those who come to work here. I feel that many people in Kinosaki love this town very much. They have affection and pride for the town. That is why we warmly welcome you from the bottom of our hearts by saying “welcome to our favorite town”. This is how I would describe the hospitality of this town.